Trundle beds are a great way to make the most out of a small space. They’re perfect for kids’ rooms and give guests a comfortable place to sleep. There are so many different styles out there that it might be hard to choose. We researched some of the top brands and best selling products and put together these trundle bed reviews. Before we get started, though, let’s take a look at some of the key features you should know. Material: There’s a bit of variety here. Most of these beds are made of some combination of wood, MDF, and composite material. We also found an awesome metal option as well as a few that are upholstered in leather. Assembly Required: Unfortunately, all of these beds have some assembly required. That’s expected since it’s really the only way to ship something this large. Don’t worry, most of them include all the tools and hardware you need. Storage: A trundle bed with storage is one way to get the most out of a piece of furniture. Not only are they two beds, some of these beds have drawers while others have shelves built into the headboard. Finish: These beds come in a variety of wood finishes. Some come in plain white, too. We also included a metal frame and two different beds that are upholstered in leather in case you were looking for something different. Dimensions: If you’re looking for a trundle bed because you’re trying to make the most out of a small room, it’s important to know exactly how much space you have. These beds vary quite a bit in size. Warranty: Most of these beds include a 1-year warranty but there are a few that don’t offer any warranty information at all. Make sure you know if you’re covered and for how long. You don’t want to be surprised if something happens. Now that you know what to look for, let’s move into our reviews. Here’s the deal, if you’re in a hurry, the best place to start is with our top and budget pick. They’re right at the top of the list and really show you the range that’s out there. Whether you’re looking for a girls or boys trundle bed, we have a lot to choose from so stick around if you can. Alright, let’s get started! 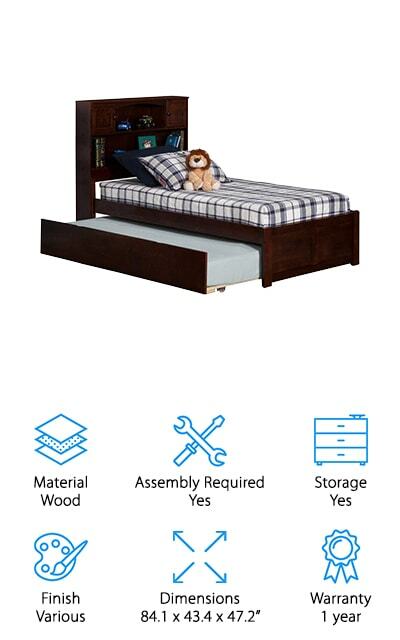 The Broyhill Kids Marco Island Trundle is our pick for best trundle bed. It’s made of high-quality solid wood along with composites and is really sturdy and durable. The bed frame holds a full or double mattress while the trundle requires a twin. Wheels on the trundle make it really easy to pull out when you need it. There are also three drawers underneath the trundle for additional storage. This is a great choice for a room that kids share, a guest room, or so there’s a comfortable place for friends to sleep during a sleepover. It’s available in two different finishes, dark espresso and crisp white. Assembly is pretty straightforward, too. One more thing, the top bed doesn’t require a box spring. Slats are included. 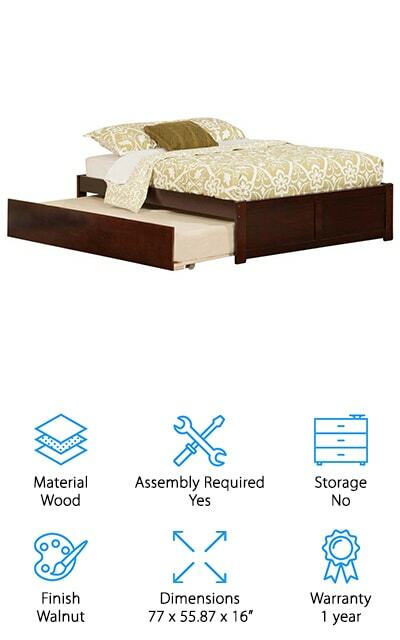 For a cheap trundle bed with a simple design, check out the DHP Bombay Daybed Trundle. This trundle consists of a daybed frame and a simple rolling trundle underneath. The bed itself is metal and has a beautiful, curvy design. 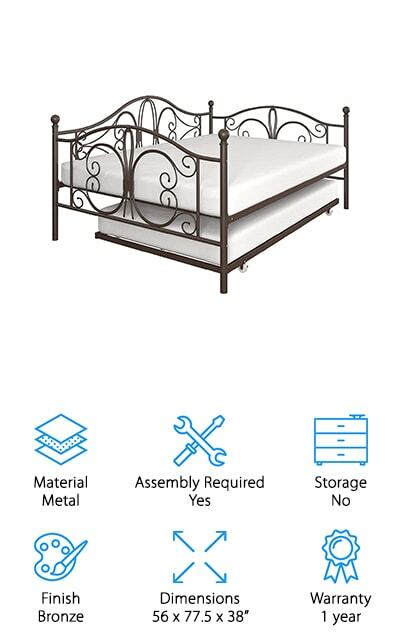 The trundle frame itself is very simple, just a flat metal frame that’s meant to hold a twin sized mattress. There are also casters in each corner, two of them lock and two do not. Why? Because that’s the best way to make sure that they trundle moves smoothly. It’s easy to pull out when needed but can still be locked in place when in use. The bed holds a full size mattress and doesn’t require a box spring. Assembly is really easy. Plus, this bed comes with a 1-year warranty. 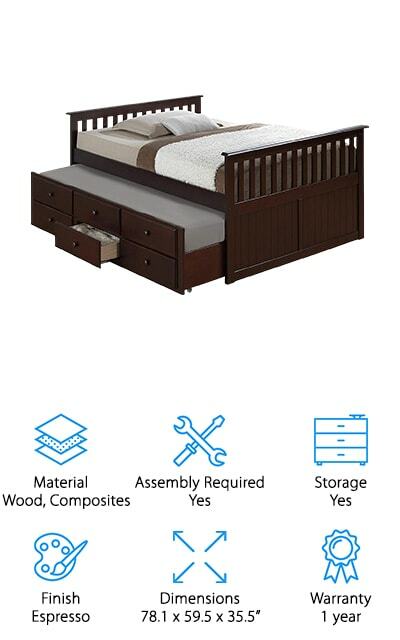 If you’re looking for an option that has a full size trundle bed, you’re in luck! The Bedz King Mission Style Trundle not only has a full mattress on top but a full size trundle underneath, too. This mission-style design has a simple headboard and is made from solid Brazilian Pine, not particle board or MDF. The child-safe finish is a gorgeous deep cappuccino brown. 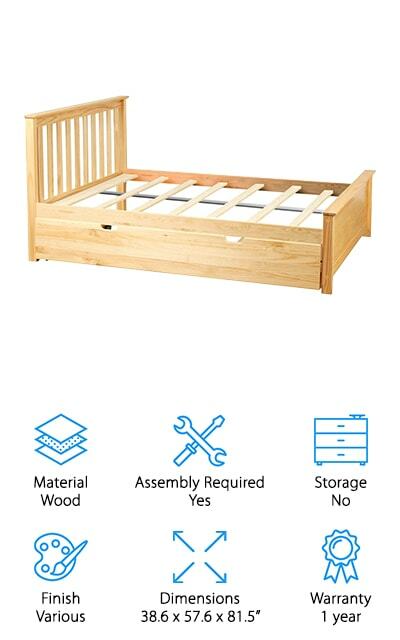 The bed includes slats for support which mean no box spring is required. The trundle pulls out from under the bed using simple silver knobs. The space between the floor and the bottom rail of the bed is 13-inches. The trundle mattress should be thinner than that since it has to fit under the bed. One more thing, assembly is required but all the tools and hardware you need are included. Next up is this beautiful trundle from Max & Lily. One of the things that stands out the most about this full bed with trundle is the finish. It’s made of solid, knot free New Zealand pine. While it’s treated with a durable, non-toxic finish, the kept the natural color of the wood which is really gorgeous. The bed includes slats so this bed doesn’t require a box spring. The design was kept minimal on purpose so it has a smaller footprint that can easily fit into a child's bedroom. That’s not all. The trundle easily rolls in and out on casters so getting set up for a sleepover is really simple. When the guests are gone and it’s time to clean up, it’s really easy to slide it back into place. The Atlantic Furniture Newport Trundle is a great looking wooden trundle bed that any kid will love. For starters, the solid hardwood construction is durable and built to last. It’s available in a few different finishes, too, so you can get the right pick for any room. You can choose from white, walnut, and espresso. Each is treated with a special five-step finish that keeps the wood protected and it safe for your kids. The bed uses a full size mattress while the trundle requires a twin. The best thing about this bed is the bookcase headboard. There are two shelves to put books, stuffed animals, toys, or anything your child wants to keep close. That’s not all, there are also two small cubbies with doors in each corner of the bookcase. 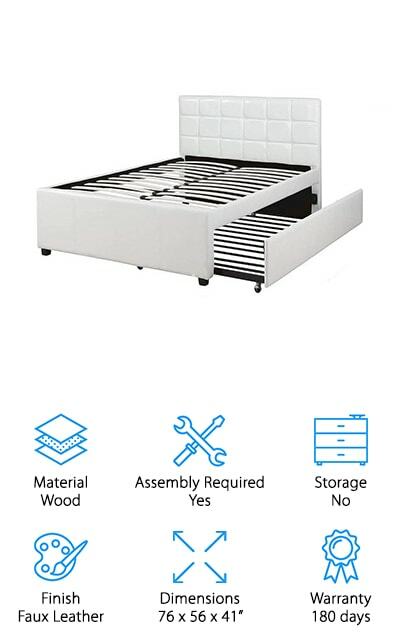 A good choice, if you’re looking for a white trundle bed, is the Poundex Trundle Bed. This bed is different from the ones that we looked at so far because, rather than having a wood grain finish, this bed is upholstered in faux leather. This really gives it a sophisticated look. While this bed would certainly make a great girls' trundle bed, it’s also a great choice for a guest room or even an adult bedroom. The top bed takes a full mattress and doesn’t require a box spring. It has a cool headboard with white faux leather squares which adds a little bit of texture to the look. As for the trundle, it has smooth rolling casters underneath so that moving it from under the bed and back again is really easy. Our next pick is the DONCO Bookcase Trundle Bed. This bed is an awesome space saver if your child’s room is a little cramped. You might be wondering, aren’t all trundle beds space savers? They are, but this one goes even further. There are three usable drawers under the trundle where you can store anything from clothes to extra bedding to use when you have a guest over. That’s not all, there’s also a pretty substantial bookshelf built into the headboard. 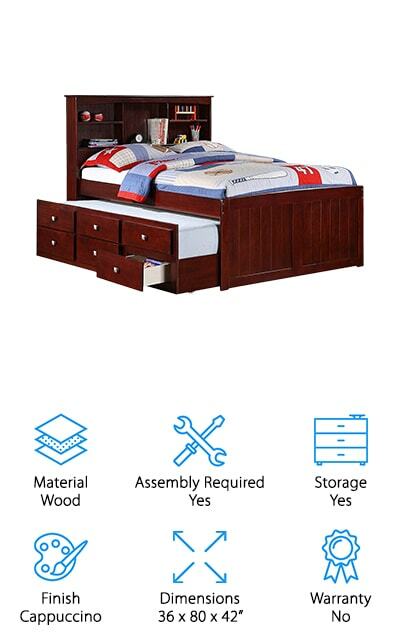 It has five shelves altogether so there’s a place for books, stuffed animals, and anything special that your child likes to keep close when sleeping. Both beds come mattress ready with slats, no box springs required. Some assembly is required and all of the tools and hardware you need are included. The Furniture of America Williamson Trundle is next in our trundle bed review. This is a beautiful full-sized sleigh style bed with gorgeous curves and a dark cherry finish. It includes a twin size trundle that fits in under the bed. Disguised as drawers, the trundle pulls out from under the bed using three matching knobs that look like drawer pulls. There are large, durable casters underneath the trundle so it’s easy to move in and out when you have guests. 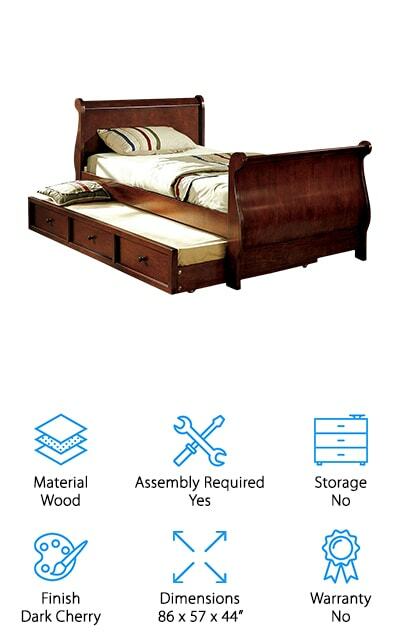 This bed is made from solid wood and wood veneer and is really durable. It would make a great addition to a guest room. Why do we say that? It's one of the most mature designs that we came across in our research, although it would be great in a child’s room, too. Next up is the Atlantic Furniture Concord Trundle Bed. This is a simple design that will match any decor whether your kid is into superheroes or butterflies. The platform design gives you a little versatility. You can set it up like a traditional bed jutting out into the room or place the long side against the wall and use it in the style of a daybed. This is a beautiful bed made of out wood with an antiqued walnut finish. 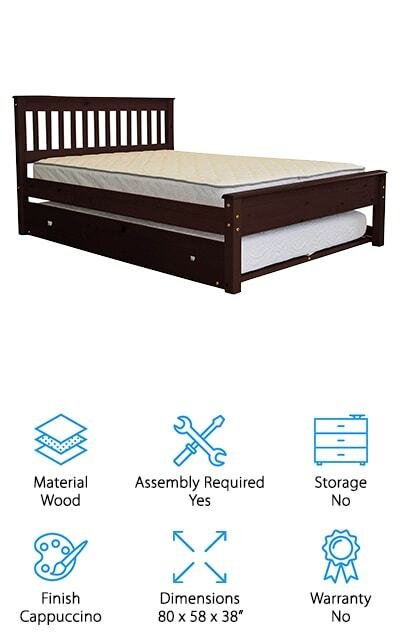 It has wood slats to support the mattress so no box spring is required. The trundle requires a twin size mattress and easily moves from under the bed using the large, smooth casters on the bottom of the platform. Some assembly is required and all the tools and hardware are included. Last but not least is the Milton Greens Stars Trundle Bed. This bed is unique as it’s the only one in our list of products that is upholstered in faux black leather. It’s a perfect fit for a guest room or even an adult bedroom. The smooth black PU leather is contrasted with white stitching which really makes the design pop. The headboard has a white-stitched grid, the footboard three double stripes. As for the trundle, it has large casters and is easy to get into position. The bed itself is full size while the trundle is a twin. 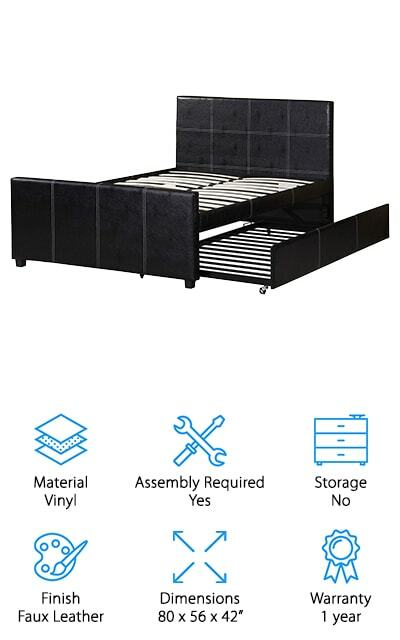 This bed does not require a box spring, just use the included mattress support slats instead. Assembly is really easy. You’ll be ready to have a sleepover with your little ones before you know it.